This is a great opportunity and a park that has a growing program. It is a great experience for someone looking to move to the next level. Please share. The permanent career-seasonal (subject-to-furlough) Assistant Fire Management Officer, GS-0401-7/9 position is open for applications. See the attachment for an Interpretation Program Coordinator position at the Morton Arboretum. For more job opportunities, visit the job board on www.interpret.net or http://www.chicagoenvironment.org/. Hope you’re having a good fall season. We just opened a new exhibition called Plant Hunters in our library and are in the midst if installing our Illumination experience that opens later this month. AND I am hiring an Interpretation Program Coordinator and am wondering if you could help me get the word out. I’m also attaching a pdf of the position description for ease of review. Would you be so kind as to forward this to the Illinois list? Interested parties can contact me with questions, but should use the link to apply. The Information Science Program at the Cornell Lab of Ornithology is currently seeking an eBird Project Assistant. This position will assist with all aspects of the eBird project. Please read through the entire position description for duties, required qualifications, and preferred qualifications. This position is based in Ithaca, New York. Don’t let the photo at right mislead you-that is a vacation day, not work. eBird has evolved from a stand-alone citizen-science project focused on collecting data, into a cooperative partnership involving several distinct user groups spanning multiple scientific domains and dozens of partner organizations, each with its own unique interests in the project’s success. eBird collects information about the distribution and abundance of birds, taking advantage of the enormous popularity of birding to create a global network of volunteers who submit bird observations via the Internet to a central data repository. Through a combination of broad-based community engagement and global partnerships, the volume of data coming into eBird has been increasing exponentially (30-40% annually) for the last decade. eBird is regarded as one of the largest and fastest growing biodiversity databases in the world. Presently, the eBird database contains more than 200 million observations of almost all known species of birds. More than 200 thousand participants have volunteered over 15 million observation hours and have submitted bird observations from 2.1 million locations and from every country in the world. In addition, eBird data are relied upon for a variety of research initiatives in Information Science, other Cornell Lab programs (e.g., Citizen Science, Education, Conservation, Bird Population Studies and Cornell), external academic institutions (e.g., Carnegie Mellon, Northeastern, U of New Mexico, U of Utah, and Oregon State), governmental departments and agencies in the U.S. and abroad (e.g., U.S. Fish and Wildlife Service, Oak Ridge National Labs, US Department of Defense, CONABIO [Comision Nacional para el Conocimento y Uso de la Biodiversidad], and nongovernmental organizations (e.g., Point Blue Conservation Science, Bird Studies Canada, Audubon) and private companies. The Cornell Lab of Ornithology is a major, globally focused institution for research, training, and public communication relating to birds and biodiversity. Information Science is one of eleven programmatic units that carry out the Lab’s mission to interpret and conserve the earth’s biological diversity through research, education, and citizen science focused on birds. The Information Science program develops data intensive techniques and applies them to massive quantities of bird observational data, with the goal of using these big data techniques for basic and/or applied research that contributes directly to the conservation of biological diversity at the species, population, or community level. One of the major projects in Information Science is eBird. Annual term appointment with possible renewal based on performance and available funding. Formal training beyond a HS Diploma of 6 months to one year’s duration or equivalent, or Associates Degree; more than four years, but less than six years or equivalent. Deep understanding of birds and bird distribution is required. Proven skills in project management and coordination are essential, along with excellent interpersonal skills. Familiarity and proficiency with the Internet and content management systems is critical, along with a strong interest in using the Web as a tool to conduct research, engage and educate the public. Mastery of common computer skills including word, email, and excel. Prior knowledge of social media outlets. Strong communication skills (written and oral) to clearly articulate vision and plans, and provide instruction effectively to all levels of management, staff, new partners, funding agencies, eBird users, and visitors. Ability to establish and maintain effective working relationships with all levels of management and staff internally and externally. Candidate will value teamwork and be able to stimulate cooperation between all employees and partners. Provide high level of initiative to anticipate needs of the project and fulfill project objectives with very minimal supervision. Ability to prioritize activities and multitask is essential. Proficiency in Spanish and/or Portuguese. 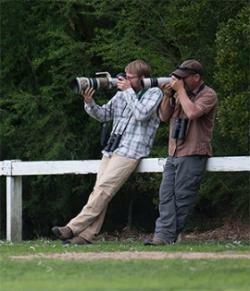 At least two years’ experience using eBird and eBird Review tools preferred. Experience with WordPress, SQL helpful. If you have any questions, please contact Chris Wood (chris.wood AT cornell.edu). Over 60 new jobs were added to EElinked and new jobs are posted every day! Requirements: You must sign up at Faner Hall, room 4248 in order to be eligible to take the exam. Note: This test is also available to the public. For additional information, please see the email below. The following are current year-round job openings in the U.S.
As a Space Camp Crew Trainer, you enter a job that immerses you in STEM education with astronauts, rockets, space travel simulators and individuals who share your passion for exploration. This opportunity will be more than just a few lines on your résumé – it’s a community, a culture, and an out-of-this-world leadership experience! Beyond the job, we endeavor to provide our staff with a multitude of professional, social and volunteer activities. On your off time, get a group together and attend local concerts, listen to an astronaut talk of their experiences in space, or volunteer cleaning up local hiking trails. The Rocket City has much to offer all year round! Free onsite housing and meals are available to our RA counselors, so with the U.S. Space & Rocket Center as your home base, the entire southeast region is waiting to be explored. If you can provide Open Availability (Sunday-Saturday: 6:15 a.m. – 11 p.m.), we want you to wear a Space Camp flight suit! Visit www.rocketcenter.com/hr for more information and to apply. Join the Space Camp Crew Trainer team today! Camp Counsellors needed immediately for year round minicamp, boarding school and summer camp in Owatonna, MN. Camp Pillsbury provides unique activities including circus arts, sports, dance, music, theatre, equestrian, magic, role playing games, technology, and tutoring services, as shown at staff. PBC is a private, non-profit organization that works with youth to promote positive growth with particular focus on working with underserved youth. Our experiential education programs are developed to meet the specific goals of each group, including leadership skills, conflict resolution, appropriate risk-taking, team building skills, communication skills, building self confidence, etc. We are seeking facilitators to work on a per diem basis at our Blairstown campus (located near the Delaware Water Gap) and lead 1-5 day programs for a wide variety of clients including urban youth, public, private and independent schools, Adjunct Facilitators work with 8-12 participants and deliver programming utilizing our adventure course, high ropes course, canoeing, and night walk activities. This is an "as needed" position during the spring and fall season. You are notified via e-mail when we need an adjunct and would need to get back to us if you are available. Room and board is included during programs. Salary commensurate with experience – range of $100-$160 per day with travel reimbursement of up to $50.00 per program. Full details and to apply online at – www.princetonblairstown.org/employment – (908) 362-6765 x1. Round Trip Airfare To and From Saipan. On Site Shared Living. Three Buffet Meals A Day. Have your attention yet??? Pacific Islands Club, Saipan is looking for energetic and enthusiastic individuals to assist in the Sports Entertainment and Activities Department (S.E.A.) PIC’s CLUBMATES are the hotel’s ambassador of fun! If you have previous camp experience, keep reading… Responsibilities include assisting with the Kids Club program, lifeguarding, teaching a wide variety of sports (tennis, windsurfing, sailing, wall climbing, beach volleyball…), participating in our nightly activity and dance shows as well as teaching various activities (water polo, water volleyball, water aerobics, and mini golf just to name a few…). Attractive compensation package for a six month contract includes hourly wage plus OT, full medical benefits, shared on-site housing, meals and round trip air transportation. Email glenn.policare for an application package. Resort information: www.picresorts.com. APPLICANTS MUST POSSESS A VALID US PASSPORT. Camp Wyoming, a Presbyterian Summer Camp and Year-Round Retreat Center located in Jones County, Iowa, is searching for an individual to serve as its full-time Program Director. We are seeking a dynamic individual to join our leadership staff as we strive to elevate our programs and ministry. The Program Director will oversee the summer camp and year-round programs and serve as a member of the Leadership Team for Next Step Consulting. Camp Wyoming prefers applicants who hold a Bachelor’s degree, training in all aspects of camp ministry programming, and at least 3 years of experience in an organized camp environment. Benefits package includes $25,000 – $30,000 salary, health insurance, 2 weeks of vacation, 2 weeks of professional development, and on-site housing (including utilities) during the summer. The opportunity to live off site during the retreat season is negotiable. Interested applicants should send a cover letter, resume, and 3 references via email by November 15th to Kevin Cullum, Executive Director, Camp Wyoming at kevin. Go to http://campwyoming.net/employment/year-round-position-openings/ for the full job posting. Camp Director needed immediately for year round minicamp, boarding school and summer camp in Owatonna, MN. Camp Pillsbury provides unique activities including circus arts, sports, dance, music, theatre, equestrian, magic, role playing games, technology, and tutoring services, as shown at CampPillsbury.com. We are seeking energetic, personable, talented and experienced team members to join our camp family year round. Camp Director will need a strong desire and ability to recruit and perform standard Camp Director operations. They will serve as the primary staff person on site and must possess a strong work ethic and strong recruiting skills. Prior camp experience and/or teaching experience needed. Room, board and meals are provided. Looking for people that are able to assist with multiple campus duties and teach multiple activities. If interested, please provide us with information regarding your experience, your areas of expertise and your contact information. Immediate openings available. Contact us at staff. Wrightsville Beach, North Carolina: Sea Turtle Camp, the marine science division of its parent company, Surf Camp Inc., is seeking a full-time year-round Camp Director. This position reports directly to the founder of the company. The primary responsibilities include; supervising and working with program coordinators to execute our overall vision and high company standards; coordinating travel programs, assisting in hiring, training and leading full-time and seasonal staff; fostering an environment of excellence in customer-service; sales, marketing strategies, budget planning and overall operations, while building long-term relationships with our campers and families. Requirements: This position will work with the Camp Director of its sister company, WB Surf Camp. Program knowledge of both divisions is required. Requirements: At least 3 years of professional camp management experience, proven experience with program and curriculum development and coordination. Masters Degree preferred. Send resume & cover letter to Will Ahlers at info. Check us out at www.seaturtlecamp.com & www.wbsurfcamp.com. Camp Magruder, a premier Christian Camp & Retreat Center of the United Methodist Church located on the Oregon coast, is seeking a full-time year-round Assistant Camp Director (ACD). Requirements: Bachelor’s degree and 3 years of professional camp management experience. Primary responsibilities include the recruitment and supervision of seasonal program coordinators and staff to develop and operate camp programs for youth, families, and adults as well as the provision of hospitality services to program partners including schools, churches, and community organizations. Benefits include housing, medical insurance for self (and family), two weeks paid vacation, and participation in the employer retirement program (after one year). The total salary and benefits package for this position is in the range of $45,000-$52,000. Applications will be received through December 1, 2014 with an anticipated position start date of January 1, 2015. To apply, please send a cover letter, resume, and at least three professional references to: Camp Magruder, 17450 Old Pacific Highway, Rockaway Beach, OR 97136 or via email to: office. Additional information about Camp Magruder may be found at www.campmagruder.org. The California-Pacific Annual Conference is looking for an Associate Cook for its Aldersgate Retreat located in Pacific Palisades, CA. As a member of the Cal Pac Camps staff, the Associate Cook assists in the preparation, cooking, serving, dishwashing, and clean-up of meals for guests and site staff. Assist in cleaning all facilities between groups, according to the established standards of cleanliness. Assists in accommodating guests in safe, clean and comfortable surroundings, supports guest groups’ programs, and enhances guests’ enjoyment and camp/retreat experience by performing the essential duties. The position is a part-time, non-exempt, regular position and reports to the Site Director. To apply for this position and request for the applicant packet, please send your resume to hr. Position is open until filled. For a full job description please visit our website at www.calpacumc.org. The California-Pacific Annual Conference of the United Methodist Church ( hr. Position is open until October 31, 2014. For a full job description please visit our website. The Shawnee National Forest will soon be advertising a GS-0303-5 Customer Service Representative (CSR) Position. The position is a permanent full-time appointment with the duty station in either Jonesboro or Vienna, IL. The purpose of this Outreach Notice is to inform prospective applicants of this opportunity. Please reply to this outreach by November 17, 2014. The Customer Service Representative reports directly to the Support Services Supervisor and is responsible for responding to routine inquiries from customers and employees in support of the overall operations of the unit. At times, the position will require the incumbent to work weekends. 1. Assist in greeting visitors, answering telephones and providing information to both the public and employees. Answer or coordinate response to routine inquiries. 2. Serve as Unit Collection Officer for maps, fuel wood permits, Interagency Passes, recreation collections and other goods and services. 3. Maintain a government purchase card and check writing authority for purchasing supplies. 4. Monitor the administrative facilities and performance of basic service contracts for office cleaning and ground maintenance. 5. Maintain and update Forest Service information displays for the public to access. 6. Maintain the office filing system and coordinate records for the unit. 7. Assist with the correspondence and various other databases for the unit. 8. Present Conservation Education Programs at local venues. Much gratitude and all the best for a fantastic weekend! The Kendall County Forest Preserve District is currently accepting applications for the Forest Preserve Director position. This position functions as the chief administrator of the Kendall County Forest Preserve District. The Director plans,organizes, directs and controls all activities to achieve the Forest Preserve District mission and specific goals and objectives. Application deadline is October 27 at 4:30 p.m.
We have been short in this area for a while and really want to get some skills back in this area as soon as possible. If you have any questions, you have my contact info. The Ottawa will soon be advertising for a GS-1001-06/07 Visitor Info Specialist for our Visitor Center in Watersmeet, MI. This is a great opportunity with promotion potential to the GS-07 level. If you have any individuals on your unit that you feel would be interested, please have them respond using the attached or by accessing the new outreach database. I would love to chat with any potential candidates as well and can be reached at the numbers below. Please see the attached position description. Please share the attached Outreach notice with those that might be ready for this opportunity! The Los Padres National Forest is currently conducting outreach to fill a NTE 120-Day Detail for a GS-0401-11 Natural Resource Assistant with primary duties as the District Resource Officer, for the Ojai Ranger District. This detail may not last the full 120 day depending upon the needs of the Los Padres National Forest. This notification is being circulated to inform prospective applicants of this opportunity and to determine interest. DUTIES: Develops, organizes and implements long-range and short-range action plans to implement Regional and National policy towards Ecological Restoration goals and objectives. Periodically revises program operations for consistency with strategies and program emphasis. Integrates and coordinates resource management program activities with other unit program areas, including but not limited to budget, project design, planning and implementation, and report coordination. Assists the Line Officer in developing and maintaining partnerships with governmental, non-governmental, non-profit, tribal government, media, academic, and other organizations to support Forest Service priorities. Leads, coordinates and participates in collaborative meetings which include a wide variety of both internal and external partners and which involves integration of complex viewpoints and perspectives towards meeting mutual goals and objectives. Prepares environmental analysis documents, management plans and other reports as needed. Provides review and recommendations for Line Officer consideration. Fully participates as a member of the District Leadership Team. Participates in strategic planning efforts at the District level and directs implementation activities for ecological restoration and collaborative stewardship activities. Represents the District Ranger at meetings with other agencies, and/or private interest groups to collaborate, share information, and/or facilitate the resolution of issues and concerns. To Apply: Respond to this Outreach with the attached Outreach Form along with your most current Resume including present position, series, and grade along with detailed work history, supervisory references, and current either by using the new outreach data base of via email directly to the contact information listed below by no later than November 5, 2014 . For those internal to the Forest Service, I encourage you use the new Agency Employment Opportunities Database located via your Connect HR. You must log into Connect HR and look for the outreach database hyperlink on the left hand side called: Employment Outreach. Once in the database you can create profile for yourself and use it to search for and respond to Opportunities throughout the Agency. Attached is the link to the Vocational Development Specialist position at Golconda, if you are interested in applying for this position please click on the link below. If you have any questions you can contact me at the address below. This announcement will be open from October 15th thru the 20th for demo and October 15th thru 24th for Merit. Please consider sharing this outreach for a recreation position opportunity in a complex and beautiful environment. Thank you. Please help us by sharing this outreach with any interested parties- advertised merit and demo. Excellent opportunity to work in the beautiful Eastern High Sierra Range and Great Basin all on one District! Multiple positions on two ranger districts in northwestern Pennsylvania. Admiralty Island National Monument will soon be advertising a position to work at the world-class Pack Creek Brown Bear Viewing Area on the Tongass National Forest in Southeast Alaska. This single position will be advertised through three different announcements and filled with a candidate from one of the applicant pools. This is a great opportunity for students interested in joining a progressive wilderness program on Admiralty Island – a National Monument, designated wilderness, UNESCO Biosphere Reserve and home to one of the densest brown bear populations in the world. Students should apply through thePathways Student Intern (Recreation) GS-0499-4/5 announcement. While the student intern completes their studies, the summer work schedule will occur around their school schedule (e.g June to August). Upon successful completion of education degree requirements, on-the-job training and meeting OPM qualifications, the position will non-competitively convert to a 13/13 permanent seasonal GS-0462-5 Forestry Technician (Wilderness) position. Anyone interested is encouraged to complete the attached Outreach Response Form. Respondents will be notified via email when the vacancy announcement becomes available. You will still need to apply for the job separately. Interested applicants must reply to the attached outreach by September 19, 2014. Please forward this outreach notice to anyone who may be interested. As a reminder, Career Services has partnered with the Center for Teaching Excellence to present a series of workshops on the Career Search. "Career Search Part I: The Job Search"
Description: The Center for Teaching Excellence, in partnership with Career Services, presents the first of three workshops about the career search. The path to a successful job and performing a job search are not easy tasks to complete. Often this search is postponed until near graduation. Beginning the search sooner is key to preparing for potential job interviews and eventually finding a good job. Join us a Jaime Conley-Holt guides us through beginning the job search.